Want to hear the worst follow-up phone call to a contact you met at a trade show? You: Hi, It’s Barry Siskind with ABC Company and we met last week at the Green Show. Contact: Yes I remember you. What can I do for you? You: We only had a few short minutes to talk about your situation at the show. The purpose of my call today is to arrange to get together to discuss your concerns and see if there is something that I can do to help. You: How about next Wednesday? You: Before we commit to a time I have a few quick questions to ask. Contact: Sure. What do you need to know? You: What exactly is the scope of the situation you are trying to solve? You: Where are you located? Do you make the decisions for this change? Have you allocated a budget? Contact: Wait a minute. Didn’t you ask me those questions when we met at the show? Contact: Why are you asking me again? The answer to the contact’s last question is simple. You forgot. The solution is to ensure that you record all of the contact’s information when you first meet so the follow-up phone call can be seamless and simply a continuation of the conversation rather than starting all over again. Numerous industry studies have shown that nearly eighty percent of all leads are mishandled. One of the reasons for this lost opportunity is that the leads collected at the show were less than adequate in the first place. Taking leads at a trade show is all about quality rather than quantity. A handful of good quality leads puts you in a stronger position to convert those leads to business than a pile of business cards or ballots. The back of a business card is small and therefore restricts the amount of information you can record. It also means that without a formal recording tool, business card leads are inconsistent from one to the next. This puts your salespeople or dealers and reps at a disadvantage when they follow up because they know very little about the contact before they make the call. Many companies print on both sides of their business card. If you had planned to write information on the business card, you are now stuck. Many companies use electronic business cards. Now you are really stuck. Many cultures take great pride in their business cards and it might be a personal offence to write on the back. 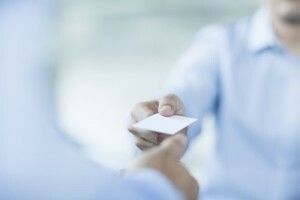 To avoid the business card pitfall ensure that you have arranged to use some form of lead recording technology in your plans. The electronic lead retrieval system. You have probably seen many of these devices in use. They take the form of scanners, QR readers, Card swipe, Smartphone apps etc. Over all these tools are excellent methods of gathering contact information. Many of these systems can be customized allowing you to enter specific fields of information that will help you when following up. A hybrid is used in the situation where the electronic system only provides you with part of the information you need. You can then supplement it with a manual lead sheet and gather the bits of information you still require. Business has moved beyond taking lead information on the back of a business card. To be truly successful at your next show give some serious consideration to the technology you will use to record contact information. One further thought. Once you have decided on how you will gather information, train your staff so they are comfortable getting the information you need.